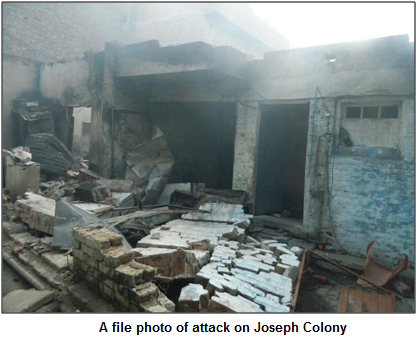 Four years back, on 9 March 2013 Joseph Colony, a Christian community in Lahore was attacked by an enraged mob of thousands. It resulted in the burning of over 170 houses to ashes and affected about 300 families. The Badami Bagh Police Station registered FIRs: in the first case, FIR No. 112/2013 offence, with charges under section 295-C PPC (Pakistan Penal Code), registered against Sawan Masih, and in the second case FIR No. 114/2013, with charges under sections 148, 149, 186, 353, 427, 436, 324, 295-A, 337-F(i), A-(i), 337-L(ii), 337-H(ii), 397, 149 of the Pakistan Penal Code and section 7 of the Anti Terrorism Act, 1997. This second case was registered against thousands of unknown accused persons and the police nominated 106 persons as directly involved in the Joseph Colony attack. The arrested accused persons were identified through electronic media footage and photos printed in newspapers, recorded at the time the people attacked Joseph Colony without restraint. All the accused persons were granted bail from courts and later faced trial. If we look at the incident, the Joseph Colony riot was sparked a day earlier, when a Christian, Sawan Masih, was arrested after blasphemy allegations against him. Mosque loudspeakers of the area were used continuously to openly instigate Muslim residents to attack and take revenge. Police personnel were deployed at Joseph Colony to quell the lurking danger but were less in number and remained helpless while the instigation turned into a large-scale attack on Joseph Colony. It resulted in ransacked houses, torched shops, burnt houses, as well the burning of two church and Holy Bibles, and also involved direct firing at the police. The criminal act of the fully charged mob caused injuries to dozens of police officials, who were immediately shifted to the hospital for medical treatment. And, above all, as a result of the lawless culture amongst the investigating agencies, there was a failure to prove guilt against the 106 under-trial accused persons and the learned trial court judge Mr. Chaudhary Muhammad Azam (Judge Anti-Terrorism Court) Lahore acquitted all accused persons of Joseph Colony attack case on 28 January 2017. In his short order, he announced that, “the prosecution could not prove its case / allegations against the accused persons beyond any shadow of doubt which was the sole duty of the prosecution so the accused are acquitted from the charge.” The trial court decision displayed the failure of the criminal justice system, showcasing the true state of rule of law in the country and respect for the Constitution. Meanwhile, on 27-03-2014 Sawan Masih, the alleged accused of blasphemy was convicted under section 295-C PPC and was sentenced to death and also awarded fine Rs. 200,000. The learned trial court judge took no notice of the basic principles of the criminal justice system and ignored 33 hours of unexplained delay in the recording of the FIR against Sawan Masih. The Chief Justice of Pakistan took suo moto notice of the tragedy of Joseph Colony and the investigating agencies presented a report before the Supreme Court and the Court observed that the complainant wanted to involve Sawan Masih only on the basis of allegations and that there was no blasphemous material. Later after 8 days the complainant through a supplementary statement introduced derogatory remarks and on the basis of the supplementary statement, the police submitted a police report. With the passage of time, the Superior Courts of the State have expressed concerns over the registration of the case, the investigation, and the trial court actions in adjudicating on the blasphemy law and have pointed out serious lapses generally caused due to the sensitivity of the issue and a mindset of religious bigotry. I, appeared before the Anti Terrorism Court as Counsel for the affected Christians of Joseph Colony and observed many flaws and unprofessional attitude of the investigating agencies and concerned quarters. After three years, nine months, and 28 days, the learned trial court observed the failure of prosecution and the shadows of doubt that this caused failed to prove the guilt of the accused persons. The police submitted report and found the accused involved in the commission of the offence and examined 85 witnesses in support of its case. The police, out of 85, examined 64 Christians of Joseph Colony who were eyewitnesses, and those who appeared at the time of cross-examination did not utter a single word against the accused and only answered that at the time of the attack they were not present at the crime scene and escaped from their houses a day before the incident. They were declared as hostile. The injured police officials, during the cross-examination, showed their negligence, although they were eyewitnesses, but their words contained discrepancies and weaknesses in the eyes of law and weakened evidence showing direct involvement of the accused persons actively involved in the attack. The same deliberate weakening of the case has been observed in previous faith-based violence in Shanti Nagar, Gojra, Korian, Sangla Hill, and Doop Sari, Lahore. The miscarriage of justice is visible in such cases, an open violation of law and dispensation of justice. For instance if the nominated accused persons have been absolved of all charges and the trial court has declared them innocent and nothing has been found against them in the eye of law, who will the Christian residents of Joseph Colony hold responsible for this tragedy? The incident brought world attention, but at the time when justice should have been done and seen to be done the alleged perpetrators of this violence have made their way through the courts for four years during which time all accused have been acquitted from the charge having been extending the benefit of doubt. 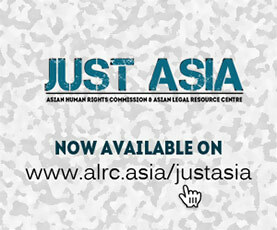 It is a misfortune for those who seek justice for marginalized communities in placed where justice is elusive hope. About the Author: Nadeem Anthony is an Advocate of the Lahore High Court in Pakistan. He is an activist for peace and religious freedom.